Universiti Kuala Lumpur is presently a leading technical university in the country operating from eight campuses nationwide. As part of our expansion plan, we invite suitably qualified candidates to be part of our team. UniKL mould its graduate with strong technological knowledge and astute entrepreneurial skills who would later fulfill the current demand of the industries. 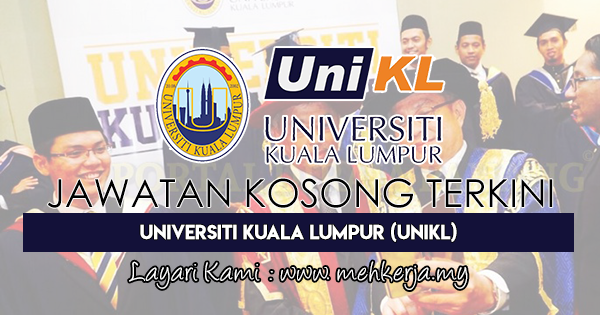 UniKL's 14 branch institutes offer various foundation, diploma, undergraduate and postgraduate programmes. With the concept of ‘One Institute, One Specialisation', UniKL contributes not only to tertiary education but also researches and development for commercialisation purposes. Strategically located all over peninsular Malaysia, UniKL's branch institutes offer various programmes in theirs niche areas of specialisation. At Present, UniKL Boasts a total of 29, 043 students. Since its inception, UniKL has produced 37,210 graduates. Graduates of UniKL have successfully established their careers or become successful entrepreneurs in local and international arena. 0 Response to "Jawatan Kosong Terkini di Universiti Kuala Lumpur (UniKL) - 9 Aug 2018"